Last week’s blogpost on the art and science of becoming a bridezilla was a big hit. We obviously struck a chord. 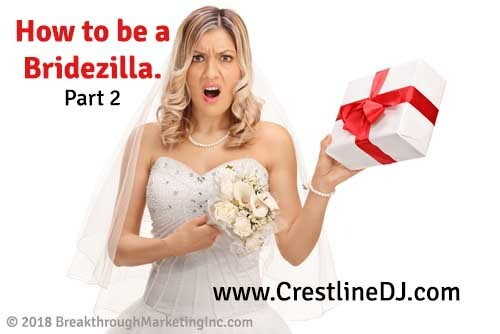 Suggestions gushed in from bridezillas throughout the area on their secrets for becoming a world class bridezilla. A recent bride, we’ll call her Brandi, said she had tremendous success by making endless demands on her bridesmaids. She insisted on an extravagant wedding shower at a cool out of town destination. She insisted they pay for it. She insisted that everyone attend, even if it strained their budget … or else. She said it worked like a charm. Those bridesmaids who still talk to her have no problem calling her bridezilla to her face. And then there’s a gal named Brittany (you may know her, so we changed the name) who not only planned a destination wedding in Hawaii, but insisted that her guests all wear color-coordinated attire to complement her color theme. Sadly, none of her invitees could make it, but Brittany and her hubby were glad to save the money and use it to go para sailing wearing color-coordinated swimming suits, no less! We heard about this next idea from quite a few bridezillas. They loved the idea of keeping their guests waiting for hours at the reception while their photographer took lots and lots of pics back at the church. The extra time allowed him to be sure he got nice posed shots as well as photo journalism, documentary, and edgy pics. IMPORTANT TIP: When you use this bridezilla technique, be sure you have a CASH BAR. There’s nothing for your guests to do while they’re waiting but to drink, which can get sort of pricey for you. Let them pick up the tab. Oh, and be sure no food is served to tide them over. These well lubricated guests will really be ready to party when you finally make your grand entrance! Here’s one more idea, which comes to us from a recent bride who must remain anonymous, she said, because her personal safety is on the line if her name gets out. Anyway, she found great success by treating her future mother-in-law as an outsider, an interloper, and as a trespassing irritant. Evidently, the bride’s attitude didn’t sit too well with mom-in-law to-be, whose brother Luigi had connections to a colorful collection of characters who got wind of these bridezilla shenanigans. Which might explain the bride’s need for anonymity. How about you? Do you have some good bridezilla techniques you’d like to share? We have not yet begun to scratch the surface! In the meantime, Crestline Entertainment offers great online planning tools which relieves brides’ stress. It’s hard to be a bridezilla when everything is nice and easy. That’s what you get with us. Great entertainment. Nice and easy professionals to work with. And stress free planning. Why wait? Check on available dates today! Or simply pick up the phone and call right now: 630-766-9898.